Suitable for all levels of experience including beginners, with demonstrations and individual tuition. 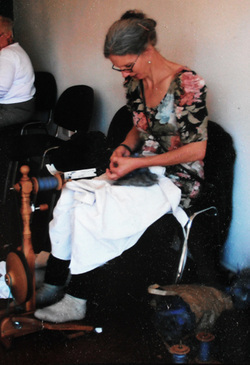 More advanced spinning skills include plying techniques and spinning with exotic fibres. Equipment may be borrowed and necessary materials purchased on the day. Cost £25:00 per day 10:30 - 4:00pm. Suitable for all levels of experience, with demonstrations and individual tuition. Equipment may be borrowed and necessary materials purchased on the day.